Ms. Ima Hapenow was devastated by the news that her ophthalmologist gave her last summer that she has macular degeneration and she is considered legally blind. In the past six months it has been such a disappointment to not be able to do all those things that she has always taken for granted. But today is the first day she is going to use this new magnifier that was delivered to her house just yesterday. Ms. Ima immediately went to read the Sunday paper which is something she always enjoyed doing before going to church. With a simple push of a button her MOJO with its CCTV docking stand enables her to read her newspaper in a manner that she has done for years. 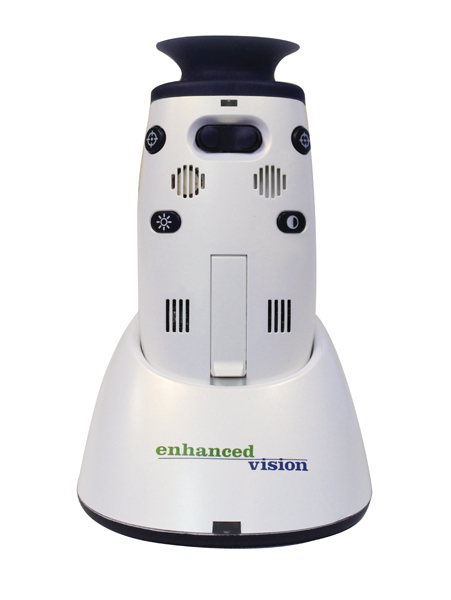 Since she has multiple viewing modes on its large 24″ screen that can easily adjust to increase or decrease of different magnification levels, she finds this reading so helpful with her vision impairment. Since it is Sunday, it is off to church and as she arrives a bit late she is sitting in one of the pews to the rear of the church. The service begins and with her taking the MOJO out of her purse , she is able to look at the small bill board at the front of the church that signified what songs were to be sung today. This was great that now she could participate again because the MOJO gave her the ability to see at a distance also. Knowing what song to sing she opened her book and placing the MOJO to her eye she pressed the zoom button to create the magnification she needed to read from the song book. Since she could now read at home (newspaper) at a distance (billboard) and even by keeping the MOJO 4 inches from her text she was able to sing along with the choir just like she used to. Afterwards she was invited for breakfast with her friends and they went to a local restaurant. In the past she felt she was disturbing her friends if she asked them to read the menu. Not today, since she read it herself and felt in total control! Her friend mentioned during breakfast that there were some gorgeous birds outside the window at the bird bath. Ima immediately pointed her MOJO at the flock and saw bluejays, cardinals, Orioles and a host of other birds at a distance. When her bill came again she could verify the amount on the receipt so she could leave the proper amount of a tip. It has not even hit noon yet and Ima realized what an incredible help this MOJO is to her. With a full day planned of watching her grandson in his little league game, a stop at the grocery store and even setting the alarm clock for tomorrow morning she was confident that she made the right decision in getting the MOJO.